View the Demo Video (English and Spanish) of the new American Classic Carousel (English and Spanish) on YouTube.com that shows children riding the Carousel and how it works. 2014 New York Toy Fair Feburary 16 through 19. Today PlasticsNews.com/China published a story that included its interveiw of Jay Horowitz at the 2009 Honk Kong Toy Fair. The trade magazine article "Officials warn toy makers not to cut corners on safety," covers how toy safety issues are affecting manufacturers, product pricing, and company profits. 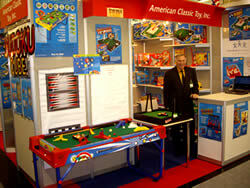 At the 2009 Honk Kong Toy Fair, American Classic Toy, Inc. owner and inventor Jay Horowitz was interviewed by the Agence France-Presse on the status of toy manufacturers in the current market. You can read the full article at FIN24.com, one of the worldwide presses that ran the article "Toymakers try to conjure buyers" sent through the European news wire. American Classic Toy is introducing several new concepts in 2009 in addition to the reissue of more great classic toys. See the Demo Video of the new SUPER POOL that will launch worldwide on QVC-TV in 2009! News release about the new Holiday Cube and Kiddee Kube (PDF) innovations. Read the online News Releases on what's happening for 2009, and Preview upcoming 2009 toys and gift ideas. 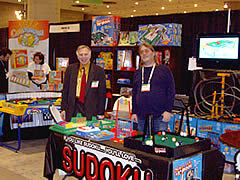 HKTDC Toys & Games (Vol 2, 2008) features the WORD CUBE and an interview with its inventor, Jay Horowitz, in its February 2008 issue. Impressed with the Word Cube at the 2008 Hong Kong Toy Fair, the article showcases the toy in its "Brain Teasers" and "Supplier Spotlight" sections. Toy Book has published an article featuring our brand new product the Word Cube. Be sure to click the thumbnail to your left for a large view of the article. In the Volume 23, Number 8 issue of Toy Book periodical published by Imagination, two brand new items by American Classic Toy were featured on page 40 and page 54. These two items are the newly announced Word Cube and "Switch Hands". You can visit the Word Cube today, and stay here for "Switch Hands" section when it is officially announced! Toy Fairs where we will be exhibiting our new products. in action and get a free ride!